The Philippine Educational Theater Association (PETA) closes its 47th season with Arbol de Fuego, Rody Vera and Loy Arcenas’ reimagining of Anton Chekhov’s Cherry Orchard. After three successful Rak of Aegis runs, and original Filipino production, FnL, PETA simmers down from the fitful comedy-musical first half of the season with a grounding of a world classic this February 2015. 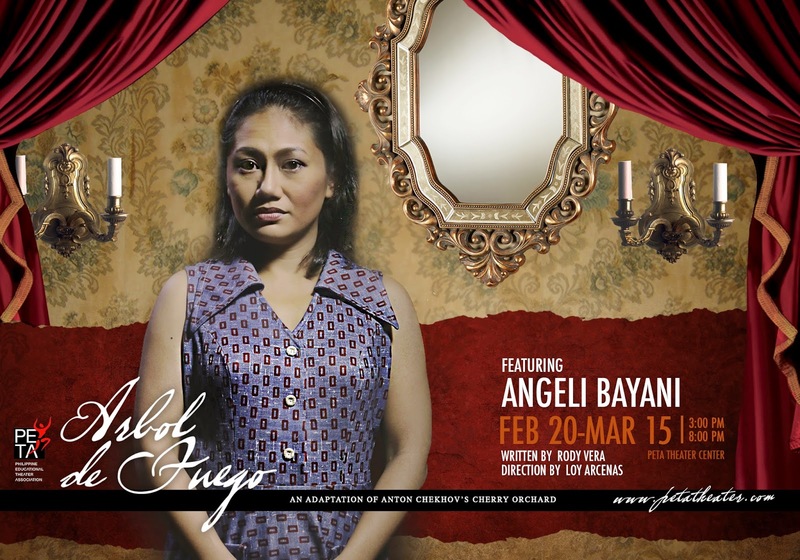 Multi-award winning writer Rody Vera, and world-renowned New York based designer-director Loy Arcenas work together for the second time on a Chekhov classic. The two has collaborated on the production Three Sisters, and have done so for film as well in the critically acclaimed Cinemalaya entry, Niño. This time, Loy and Rody tell the story of an aristocratic family’s decline in 1970’s Negros Occidental. 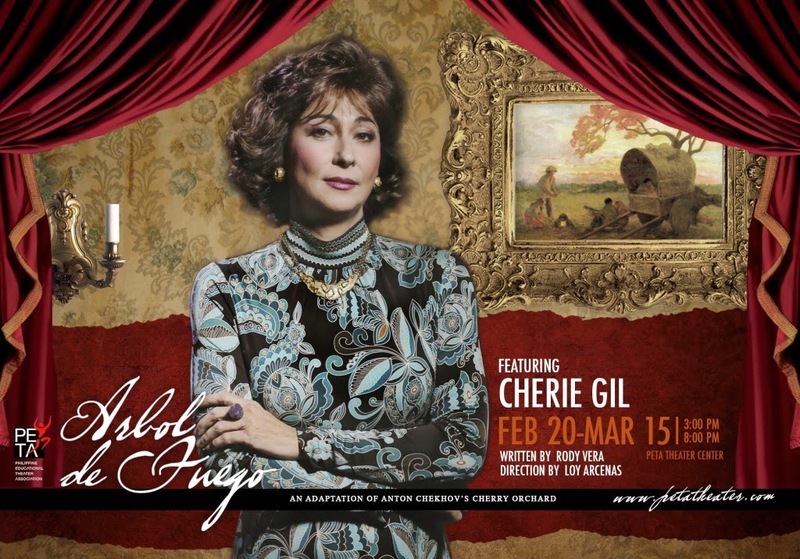 Middle-aged matriarch Enriquetta Jardeleza-Sofronio, played by veteran actress Cherie Gil, comes home from Madrid being forced to sell their estate to pay off the family’s huge debts. The Jardeleza’s throw party after lavish party, reminiscing their opulent past amidst their depleting wealth. 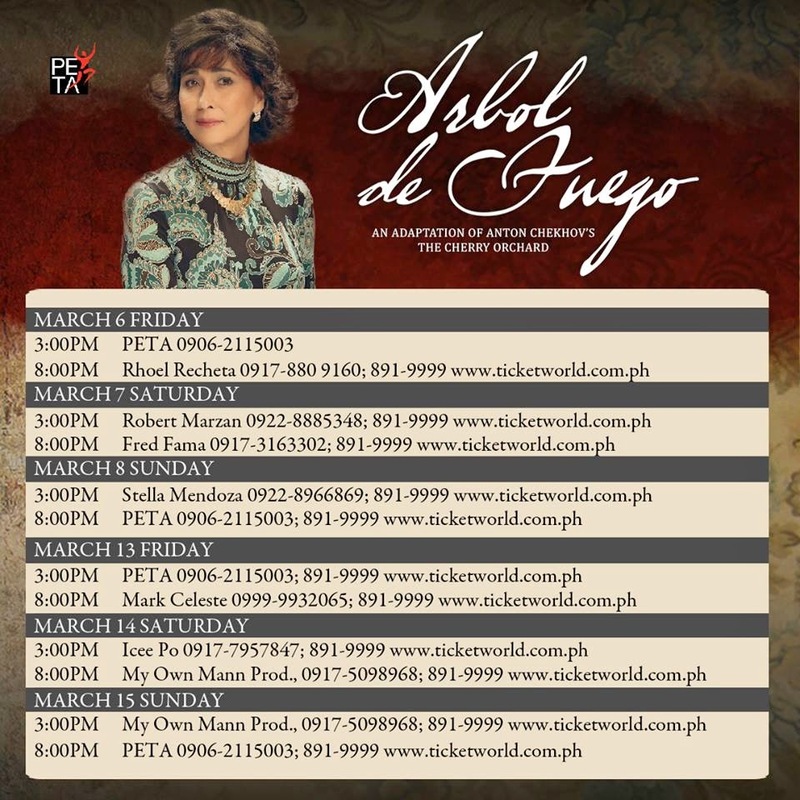 Touted as Loy Arcenas’ theater comeback since Three Sisters, Arbol de Fuego boasts of a stellar cast. Alongside Gil is Urian best actress awardee Angeli Bayani, British Independent Film Award nominee Jake Macapagal, Bembol Roco, Anna Luna, Leo Rialp, Raffy Tejada, Riki Benedicto and many others. 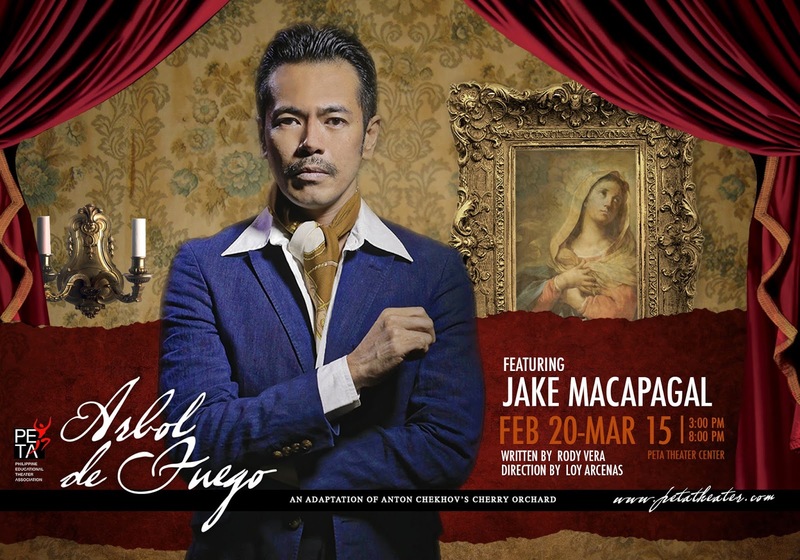 Arbol de Fuego opens on February 20, 2015 with shows from Fridays to Sundays, 3:00pm and 8:00pm at the PETA Theater Center, No. 5 Eymard Drive, New Manila, Quezon City. For more information, contact PETA at 725 6244 or 0917 5765400 or email us at petatheater@gmail.com.